La série Red Sonja s'achève au #49 pour laisser place à une nouvelle série: Queen Sonja! Written by Joshua Ortega, art by Mel Rubi, covers by Lucio Parrillo, Rubi and Jackson Herbert. 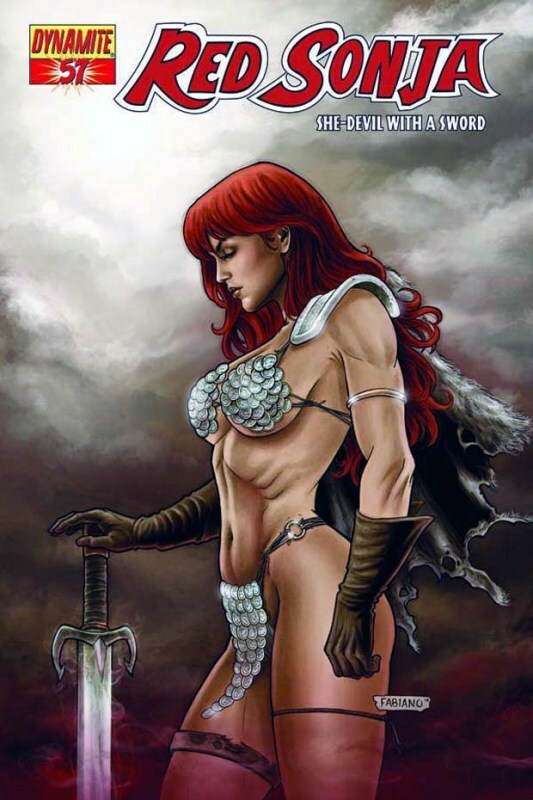 Red Sonja lives! 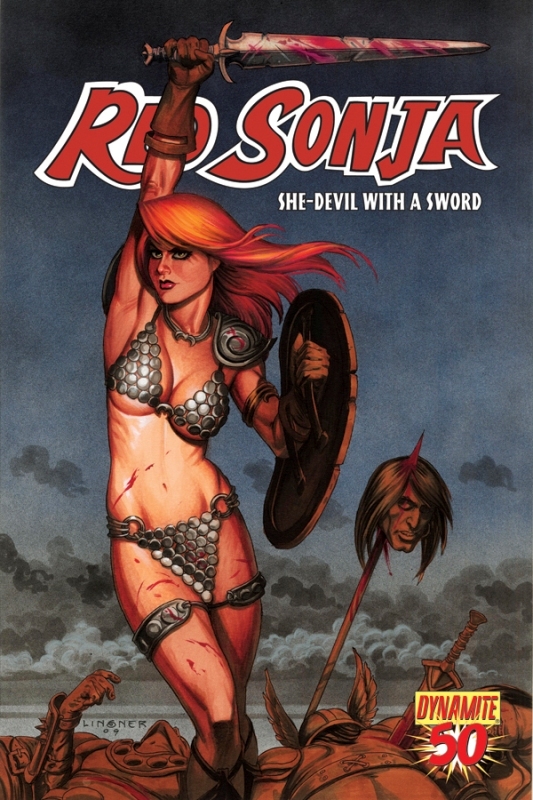 Dynamite Entertainment presents a bold new direction for the mother of all warriors, Red Sonja! Sonja finds herself with more than she bargained for as she takes the throne of her homelands! This first issue also features bonus pages of Red Sonja material, including an all-new Red Sonja short story! Written by Joshua Ortega, art by Mel Rubi, covers by Rubi, Lucio Parillo and Jackson Herbert. The story of Sonja's march to the throne continues in a tale of intrigue and power in the ancient lands of Hyboria! Le pitch est une reprise de ma célèbre introduction des livres de Conan! Written by Joshua Ortega, art by Mel Rubi, cover by Lucio Parillo, variant covers by Rubi and Jackson Herbert. All Hail Queen Sonja! 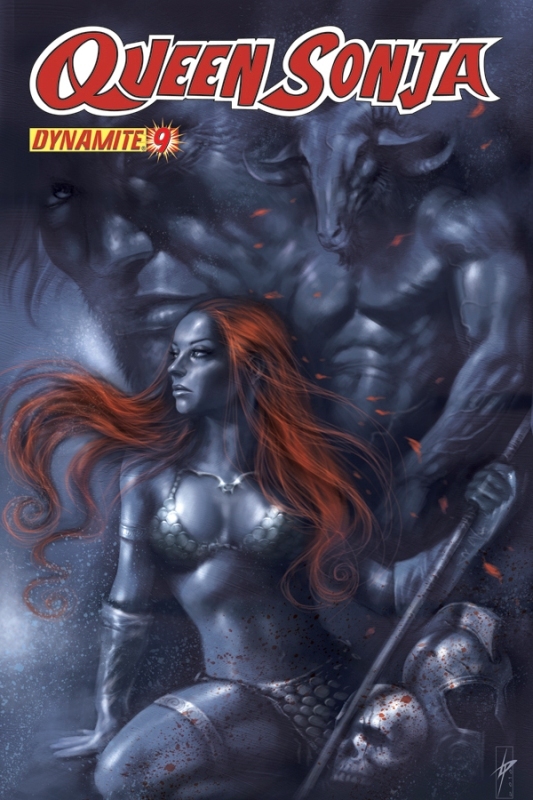 Dynamite has returned the She-Devil to what she does best; only this time, the red-headed warrior has more than just herself to look out for, she has a whole kingdom! The story of Sonja's march to the throne continues as writer Joshua Ortega and artist Mel Rubi weave an incredible tale of intrigue and power in the ancient lands of Hyboria! The first story arc comes to a conclusion! Sonja is seated on the throne, and now the adventures can truly begin! Les dessins sont moins attirants que sur la précédente série je trouve. After the thrilling opening adventures of the all-new, all-different Queen Sonja, Dynamite proudly presents the next chapter! Herbert and you’ll see just why Queen Sonja is the best fantasy book on the racks! love? Find out in this issue! of art captures every dramatic detail of the She-Devil with a Sword. Jackson Herbert). Mysteries unravel and blood will be spilled! Written by Peter Brett, art by Walter Geovani, covers by Joseph Michael Linsner, Paul Renaud. 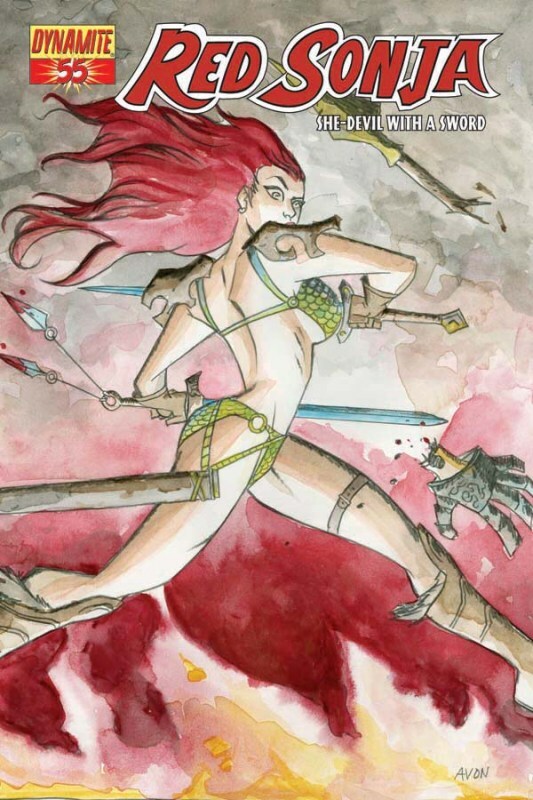 Red Sonja returns to her roots under the skillful hand of new writer Peter V. Brett! Brett, an acclaimed writer of fantasy novels, is the author of the ongoing Demon Trilogy, whose first volume The Painted Man, was published in 2008, and the second novel, The Desert Spear was published in 2010. Written by Arvid Nelson, art by Jackson Herbert, covers by Jackson Herbert, Mel Rubi, Lucio Parrillo. The second story arc of Queen Sonja concludes! Writer Arvid Nelson has pushed the She-Devil to her limits, taunting her with forbidden love, palace intrigue and a world filled with monsters and demons! See how it all concludes here! Written by Roy Thomas, art by Esteban Maroto, cover by Frank Brunner. Classic Sword and Sorcery action! 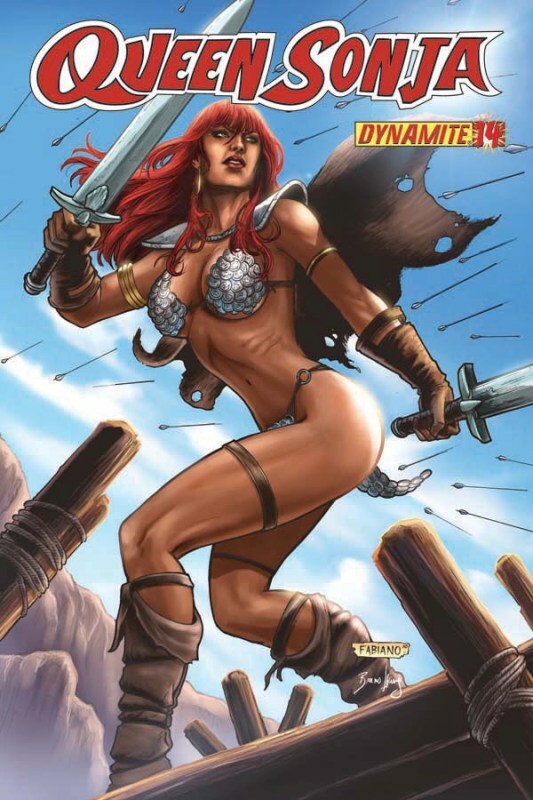 An all new series reprinting classic Red Sonja tales! Continuing the incredible story ("The Ring of Ikribu" from Savage Sword of Conan) by the legendary Roy Thomas, joined by artist Esteban Maroto. Remastered in color for the first time ever! all readers! 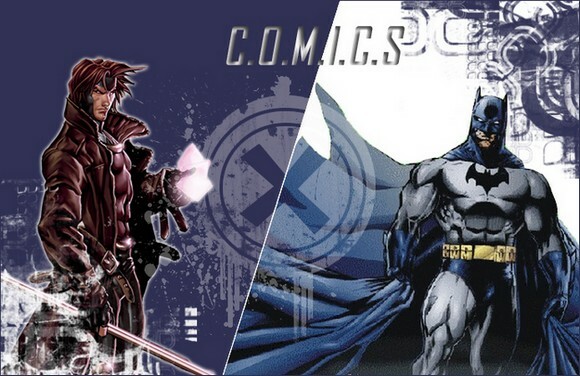 Featuring the art of Walter Geovanni! Written by Eric Trautman, art by Walter Geovani, covers by Paul Renaud and Geovani. Trautmann takes over Red Sonja as she goes on another magical adventure. This is a great entry point for everyone's favorite She-Devil With a Sword! Written by Luke Lieberman, art by Mel Rubi, covers by Fabiano Neves and Carlos Rafael. Before she was a queen or a warrior, before she was Red Sonja, she was a thief known only as "Red." Her pride and skill are put to the test by a new partner in crime. Together they discover corruption deep in the heart of Dah-Disha and in the gamble find each other. trouble as she learns that one does not take lightly from Lord Fellon. pivotal turn in Sonja's journey from wild child, to thief, to warrior. From wild child, to thief, to warrior - the metamorphosis is nearly complete as Sonja and Kain confront Lord Fellon in his lair. A suicide mission, but they must atone for their sins. And what of Jubal, their master, where do his loyalties lay? A thrilling episode that strikes at the heart of Red Sonja's psyche! A violent storm floods the lonely countryside, and Sonja takes shelter in a cramped Inn. After a deadly altercation with the town bully, Sonja vows to keep out of the locals' power struggles. But when the dead man's brothers appear, all Hell breaks loose indoors as Mother Nature rages around them, threatening to awaken a long buried horror in the earth. Written by Eric Trautmann, art by Walter Geovanni, covers by Paul Renaud and Geovanni. A new adventure begins! 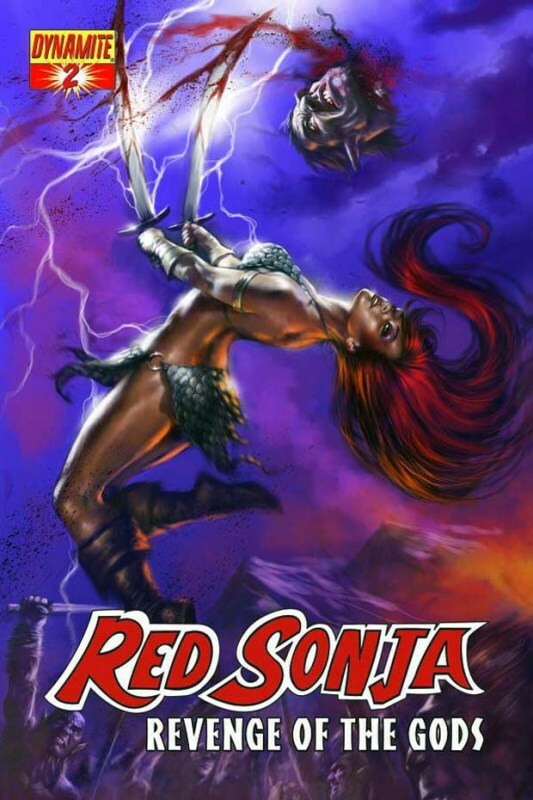 Following the deadly events in Shem, Red Sonja makes her way to Koth -- and a family dispute between rival princes, all keen to seize the throne. And amid the intrigue and the skullduggery, assassins lurk: enemies, loyal to an old adversary that will stop at nothing until the She-Devil with a Sword is dead. Written by Arvid Nelson, art by Chris Bolson, covers by Fabiano Neves and Bolson. Written by Eric Trautmann, art by Walter Geovani, covers by Fabiano Neves and Walter Geovani. Red Sonja's wanderings have brought her to Koth and a gathering blood feud amongst that kingdom's ruling families. With deception lurking in every shadow, and the fate of a nation at stake, what better place is there for a sword for hire? Red Sonja's adventure in Khorshemish ó the opulant capital of Koth ó continues. Political and family intrigues have placed the She-Devil With A Sword between rival noble families, all intent on seizing the throne of Koth. On one side, the disgraced family of her slain enemy ó Cavvalus of Koth ó plots Sonja's destruction. On the other, Strabonus, Prince of the realm, and quite possibly insane. Amidst assassins, alchemists, and royal intrigue, Sonja discovers that not all wars are fought with swords. Written by Arvid Nelson, art by Chris Bolson, covers by Fabiano Neves and Carlos Rafael. Sonja's taken enough poison to kill a wooly Rhinoceros. But she's no wooly Rhino, she's Sonja! She awakens from her poison-induced coma into a very new reality: Thulsa Doom has destroyed her capital, and with the help of his evil god, Set, he is rounding up Sonja's subjects, for an unknown but surely extremely unpleasant purpose. Thulsa hires the very mercenary band whom Sonja fielded against the Emorans to hunt the refugee Queen down. Not all of the mercenaries are feeling good about their new assignment, but don't they have much say in the matter -- Thulsa will kill them if they don't succeed! Written by Eric Trautmann, art by Walter Giovani, covers by Fabiano Neves and Giovani. Trapped between rival factions eager to seize the throne of Koth, Sonja discovers that there's more than shifting allegiances and court intrigues at work. Ancient alchemy and forgotten sciences may be more powerful than even Red Sonja's blades. Written by Luke Lieberman, art by Daniel Sampere, covers by Lucio Parrillo. Loki just loves it when a plan comes together, this usually means bad news for, well, everyone else. 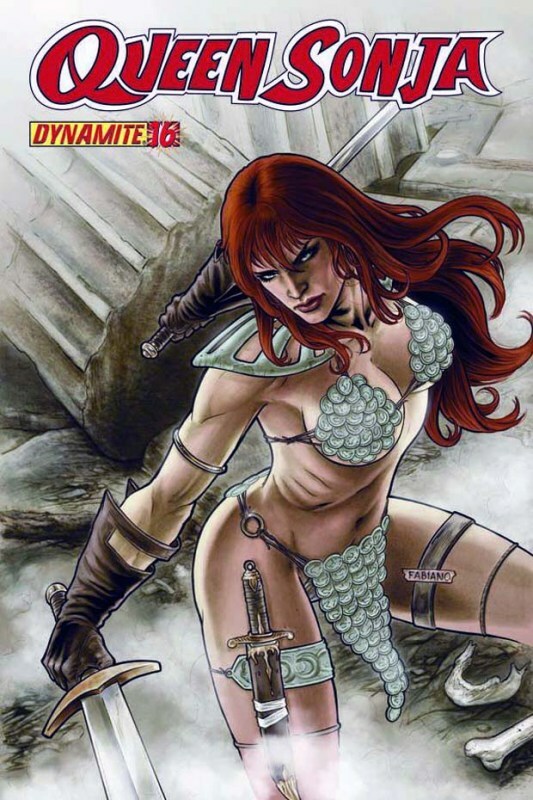 Red Sonja struggles to defend her friend's kingdom from destruction and stop Loki from unleashing an even greater danger on the Hyborian world.